The Sewage Treatment Plant process is similar to the way that a Septic Tank works but mechanical components provide additional processes to help break down solids to produce a cleaner, more environmentally friendly effluent. Wastewater and sewage, usually from a number of properties, are fed into the primary settlement tank where solids and liquids separate and the liquor flows into the biozone chamber. In the chamber, a pump aerates the waste and encourages good bacteria to digest the organic matter, breaking it down and purifying it. As it leaves the final chamber, known as the humus chamber, the effluent is typically 95% clean and ready for discharge into local watercourses, ditches or land drainage systems, subject to consent by the Environment Agency. CSG are experts in the maintenance of small-scale Sewage Treatment Plants, keeping mechanical components in perfect working order through regular servicing. 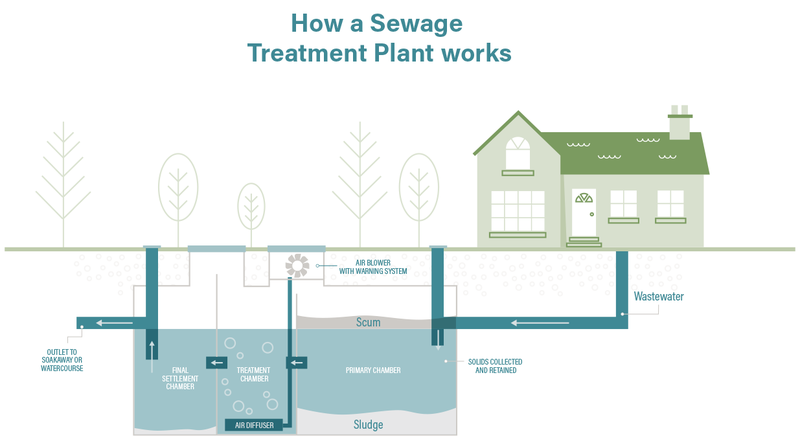 Sewage Treatment Plants also need to be emptied at least once a year to keep the system free of the sludge that accumulates naturally over time. We offer a fast, friendly and efficient service for homeowners who need their Sewage Treatment Plant maintained or serviced, or simply need some help or advice from the experts in domestic sewage collection.